Ophiuchus - a 13th Sign? No! Ophiuchus is a constellation of stars visible in the northern hemisphere between the constellations of Scorpio and Sagittarius. Depending on where one considers the boundaries of the constellations to lie, it may be considered to intersect those two constellations. In such a case, the Sun, the Moon and the planets, during the course of their apparent passage through the constellations, will pass through Ophiuchus after leaving Scorpio and before entering Sagittarius. However, there is no such thing as a zodiacal sign called Ophiuchus. There is no way that your sun or star sign could be Ophiuchus. Let me explain further. Ancient and medieval astrologers considered that there were 48 constellations. Of these, 12 were considered 'zodiacal' constellations, the other 36 were considered 'extra zodiacal' constellations. 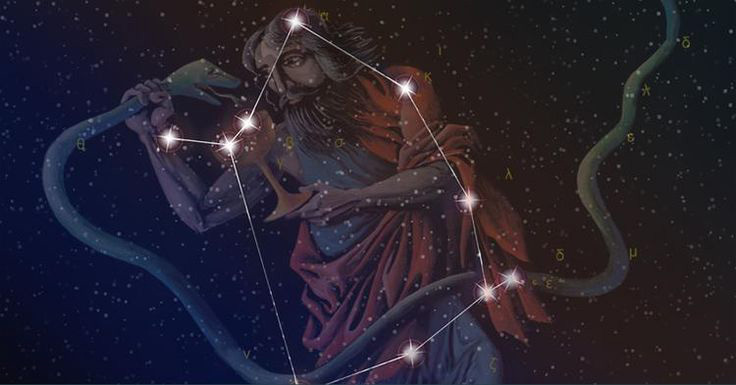 The 12 zodiacal constellations are those through which the Sun appears to pass during the course of a year, and their names (Aries through to Pisces) are familiar to anyone interested in his or her sun or star sign. Ophiuchus is one of the 36 extra zodiacal constellations - not one of those through which the Sun is considered as appearing to pass. The ancient world delineated three zodiacs. First, the Constellation Zodiac. This comprises the 12 constellations familiar to us as zodiacal, these 12 being of unequal length. Then there are the Sidereal Zodiac and the Tropical Zodiac, each comprising 12 signs of equal length. The Sidereal Zodiac is a regularization of the Constellation Zodiac to make 12 signs of equal length out of 12 constellations of unequal length. Note that even in so-called 'sidereal' astrology, the sign in which the Sun is considered to be may not be the same as the constellation through which it is passing, due to the unequal size of the constellations. The difference between sign and constellation is more pronounced where the Tropical Zodiac is used (as is normal in western astrology). Whereas the Sidereal Zodiac is a division of space, the Tropical Zodiac is a division of time, and is related to the seasons. Where the Tropical Zodiac is used, the Sun is considered to enter the sign Aries at the northern Vernal (or Spring) Equinox (around March 21/22) no matter what constellation it is apparently passing through at the time. At around the year 0 (the beginning of the Christian Era) the Sidereal Zodiac and the Tropical Zodiac coincided. Whichever zodiac one used, the Sun entered the sign Aries at the same time. However, due to a phenomenon known as the Precession of the Equinoxes, the Sun at the northern Vernal Equinox has since then been drifting back through the Sidereal sign Pisces. When the Age of Aquarius arrives (there is no consensus as to the date) the Sun will be in the Sidereal sign Aquarius at the northern Vernal Equinox. But from the point of view of astrologers who use the Tropical Zodiac, the Sun will still enter the sign Aries at this Equinox. The difference came home to me some years ago when I was in a part of the world where absence of artificial light enabled the constellations to be clearly visible at night. As a western astrologer I knew very well that Mars was in the sign Virgo at the time. But looking up there was the red planet clearly within the constellation of Leo! From time to time modern astronomers, either ignorant of the difference between the zodiacs or wishing to pour scorn on astrologers, like to point out the discrepancy between the sign a planet is said to be in and the constellation through which it is passing, or to claim that Ophiuchus is a sign that astrologers are ignoring. Both the existence of Ophiuchus and the Precession of the Equinoxes have been known about and taken account of for hundreds of years. Ophiuchus is just one of many constellations that are not included amongst those named as signs. Neither in the Sidereal Zodiac nor in the Tropical Zodiac is there a sign called Ophiuchus.